How Do I Know If My Student Loan Is In Default? You could be in danger of defaulting on your student loan if you are not current on your monthly payments. Federal student loans are considered to be in default once you are 270 days behind on payments. If you have a private student loan, you should refer to your promissory note. Your promissory note will detail when your account is considered to be in default. The terms of a private student loan are really at the discretion of the lender and are typically very strict. Private student loans usually default after just one missed payment. You will know that your private loan has defaulted when you begin to receive collection calls and letters from a collection agency instead of your usual student loan servicer. Once your private student loans have been charged off, they are considered defaulted and cannot be brought back to good standing. What Happens Once Student Loans Are In Default? Defaulted student loans are assessed a huge collection fee. That fee is typically a percentage of the student loan and it could be as high as 25%. Once your student loans are in default any tax refunds you are owed will more than likely be intercepted and applied toward your loans. 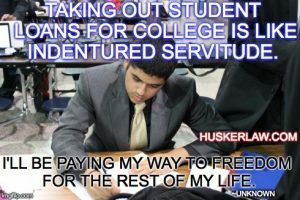 Additionally, your wages can be garnished to repay your student loans. This can and usually does happen without a judgment from the Court. This means that your student loan can administer a wage garnishment simply by contacting your employer. They can take 15% of your disposable wages. They can also take 15% of SSDI, not to exceed an amount that would leave the borrower with less than $750 in SSDI.